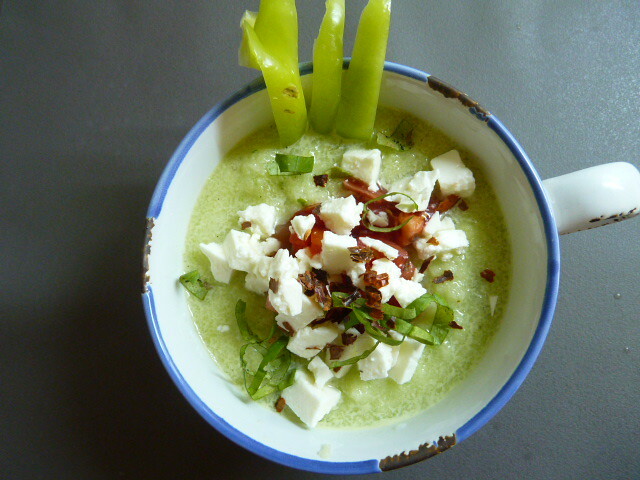 It’s still too hot to cook, so today I made one of my favorite soups: cold cucumber gazpacho. It’s very easy, and no heat is involved in the preparation. 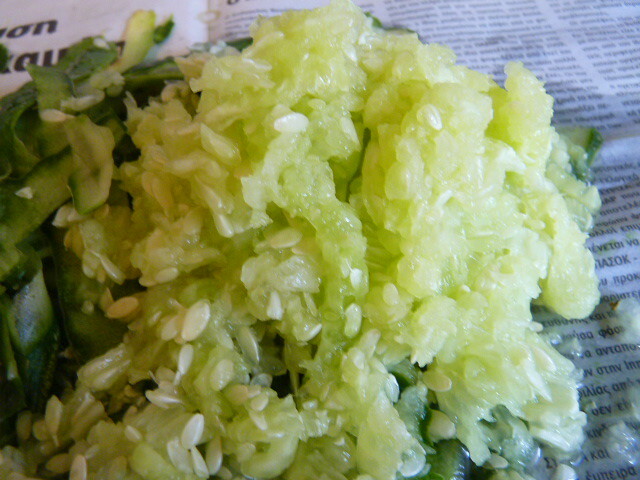 Trim and peel the cucumbers. 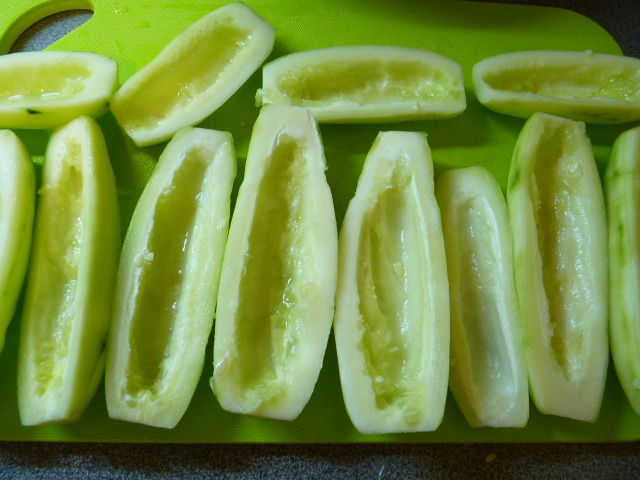 Slice in half lengthwise and remove the seeds. Cut into cubes. 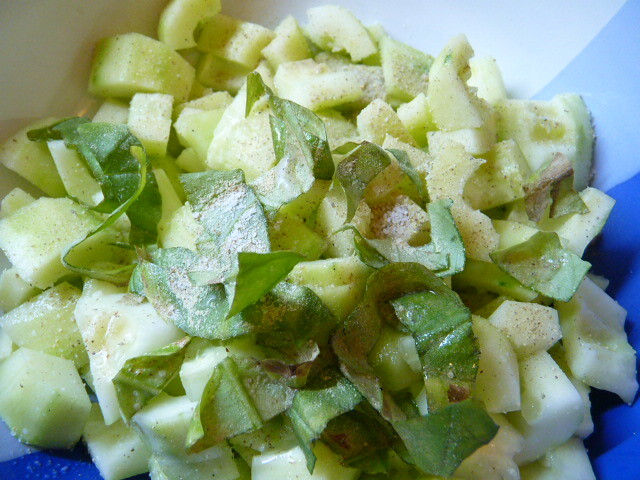 In a food processor, combine the cubed cucumber, the vinegar, garlic olive oil, milk, 3-4 basil leaves, salt, and pepper. Puree. 1. 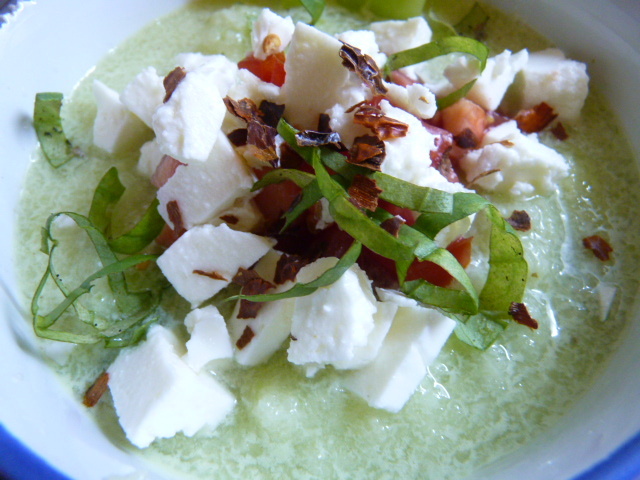 In a food processor, puree together cucumber, vinegar, olive oil, milk, four basil leaves, salt, and pepper. Divide into bowls. 2. 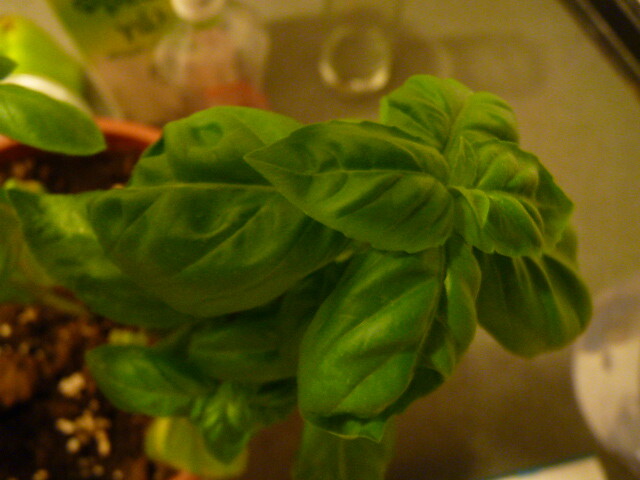 Top with the tomato, feta, and basil. 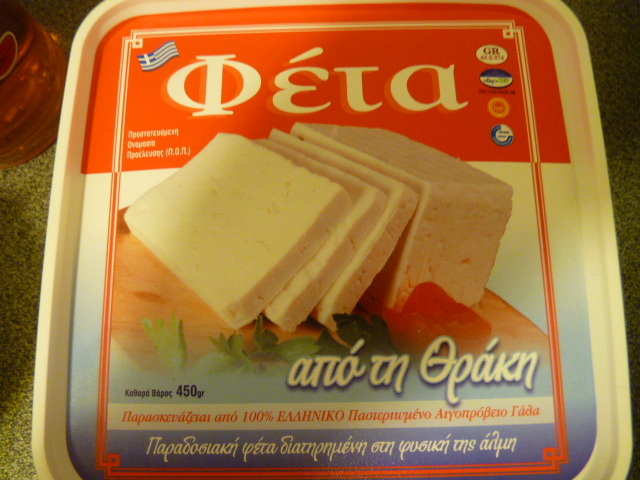 If using, sprinkle the pine nuts on top. 3. Serve cold with barley rusks or crusty bread. It’s hot here in Greece. Yes, I knew it would be hot when I moved here. But… honestly, it’s hotter than I bargained for. It’s been so hot that I’ve already been swimming in the sea six times. (If you know me, you might know that I never swim before the end of July because the water is too cold.) It took me 13 years before I finally broke down and started wearing shorts here in Greece (Greek women don’t usually wear shorts because “shorts are for 8 year old boys” and since Greek women are my style icons, I stuck to this rule) but this past week, I’ve been wearing shorts every day. Shorts I stole from my husband, of course. And I just hate cooking in the heat. I even hate eating in the heat, and that’s really saying something. But we invited some friends over for dinner, and that meant that I had to make something for them to eat. Considering the fact that lately we’ve been eating tomatoes and cucumbers while fanning each other, I knew I had to make some food that wouldn’t heat up the house, or me, or the people eating it. So I decided on Israeli food. I decided to stick to the big classics for two reasons: our guests are very new to Israeli food, and we had all the ingredients for all this stuff on hand. (That’s an extremely important consideration for me at the moment.) 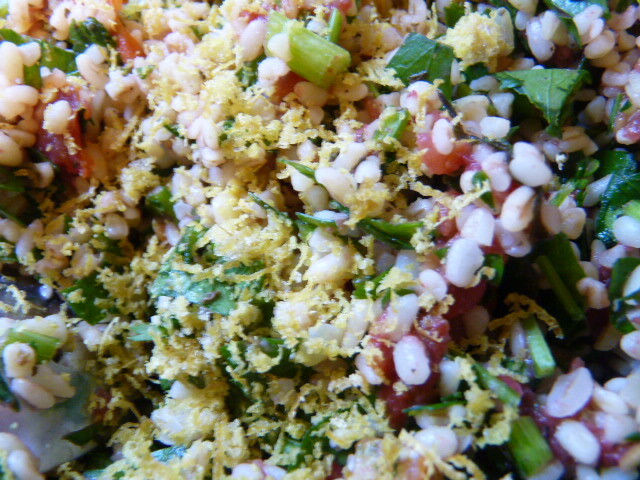 I made a classic tabouleh, which is great because at no point is any part of it cooked, and it’s served cold. 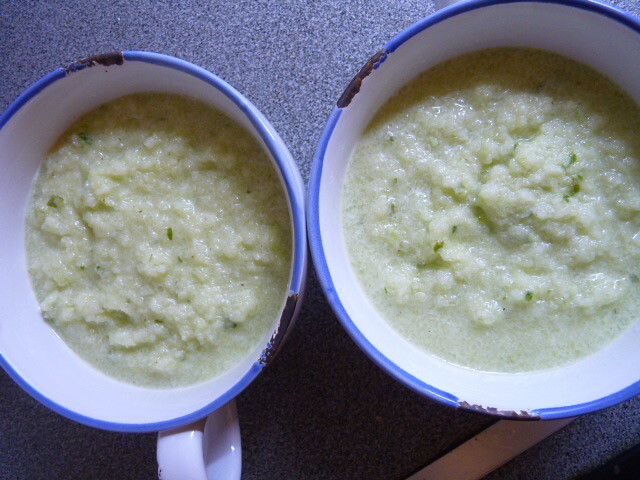 It’s a refreshing and cooling food perfect for heat waves. I made classic Israeli hummus, which we all love so much – really, is there anyone who doesn’t love homemade hummus? 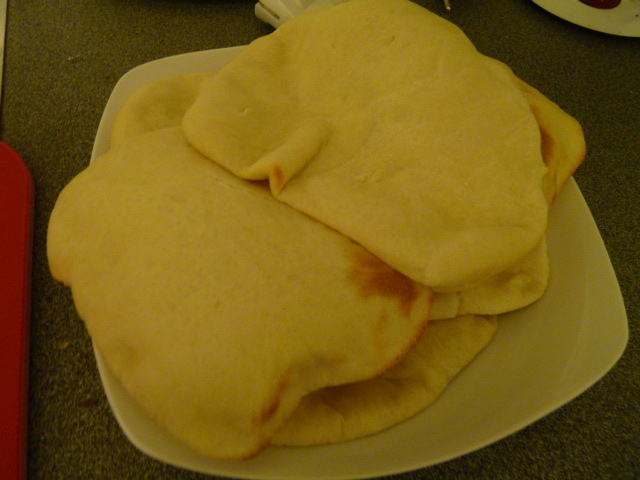 And of course my pillowy pita bread which was taught to me by an Israeli friend. And finally a couscous and chickpea salad. A great thing about couscous is that it also barely needs to be cooked. I cooked the chickpeas for the hummus and the salad at the same time in the pressure cooker – quick and very little heat in the kitchen. If you have canned chickpeas, you can avoid cooking altogether – except for the pitas. There’s no way around that one. The pitas need to be in the oven. Sorry. Our guests loved these dishes, and they’re so simple that you can make this spread on a weeknight – even the pita isn’t that time consuming because, if it’s hot outside, you can put the dough outside to rise and it only takes half the time! First, soak the chickpeas. This whole spread is to feed four people, but I made a lot of everything so that we could eat leftovers for a few days. This will make a lot of food. I used 500g of chickpeas. Just put the chickpeas in a bowl with water in the morning before you go to work and when you come home, they’ll be ready. 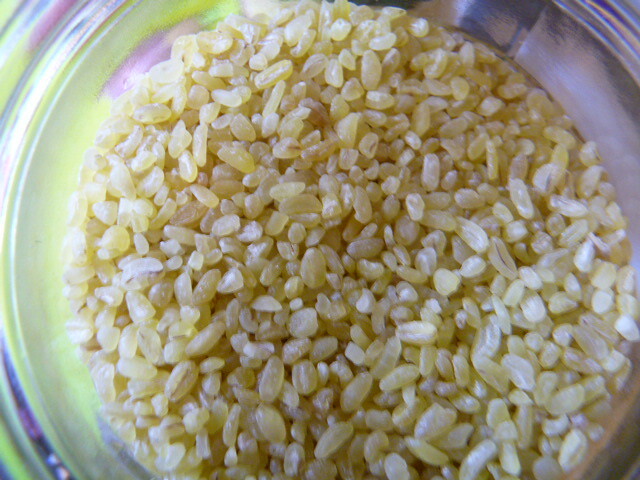 I used 150g of bulgur wheat. It’s a lot… trust me. 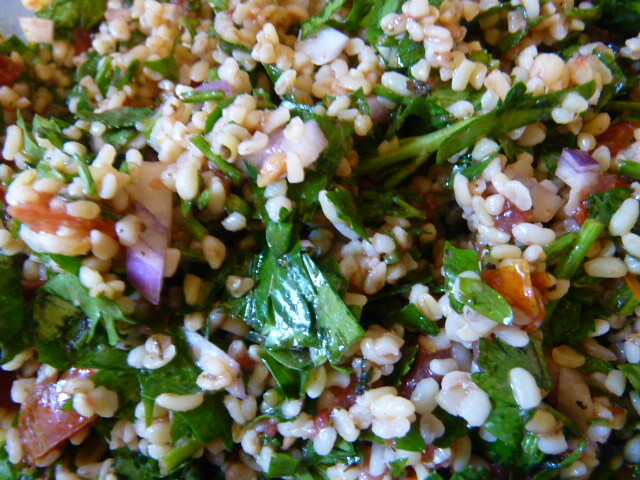 It might not look like much but once it plumps up, you get a huge bowl of tabouleh. Cut the tomatoes directly into a large bowl. This is important: don’t use a cutting board! 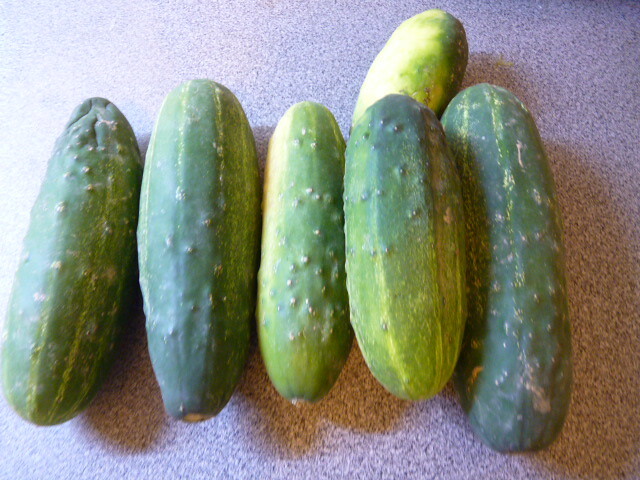 Try to cut them into very small pieces. It’s not easy because of the bowl but do the best you can. The reason for this is to keep all the tomato juice in the bowl. Stir in the bulgur and mix well. Cover with plastic wrap and set aside while you make the pita bread dough. The reason I do it this way is so that the bulgur absorbs all the tomato juice. After about an hour, add the mint, lemon juice, onion, and parsley to a large bowl. Stir in the tomato and bulgur mixture. Add some salt and the olive oil. Stir well and cover. I don’t refrigerate it because I don’t like the taste of refrigerated tomatoes. It’s cooling enough without being refrigerated. 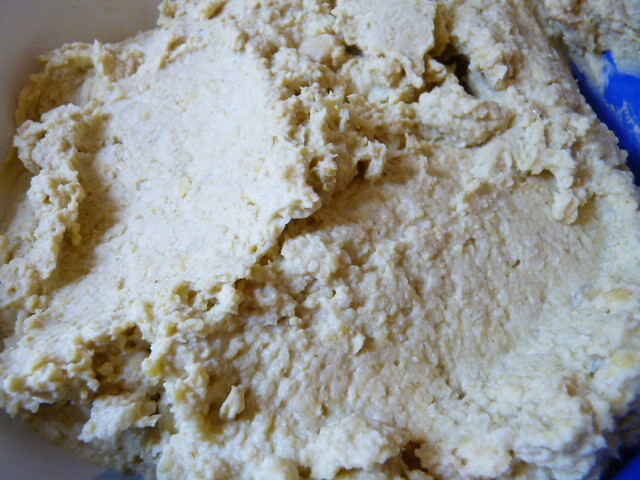 To make the hummus, drain and rinse the soaked chickpeas. Cook them in the pressure cooker covered by about an inch of water for about 10 minutes or until soft. Reserve about a cup of the cooking water. Drain and rinse. It’s not necessary to remove their skins. In a food processor, combine 3/4 of the chickpeas (the other 1/4 will be used in the couscous salad) with the lemon juice, garlic, tahini, salt, and cumin. Process until smooth. Add a bit of the cooking water if it’s too thick. 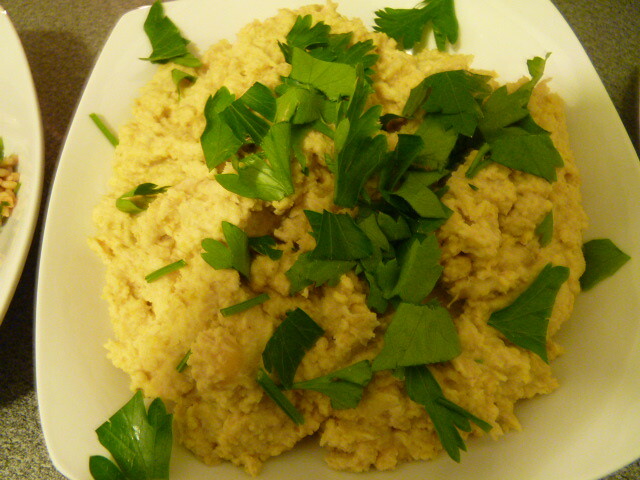 Stir a few tablespoons of the remaining cooked chickpeas into the hummus and put on a plate. Sprinkle fresh parsley over the top. 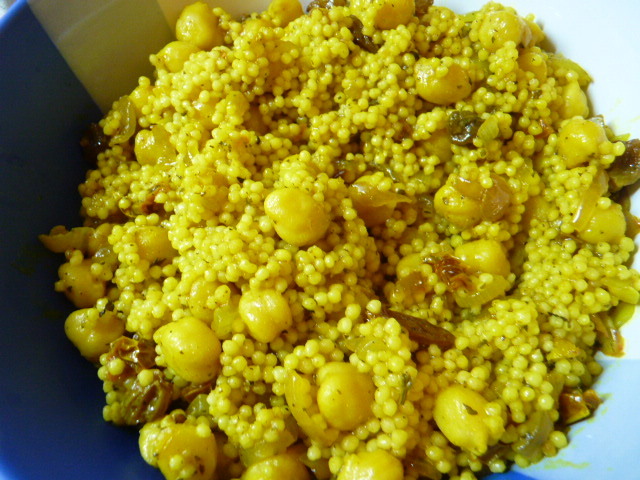 To make the couscous salad: in a frying pan sprayed with olive oil, quickly saute the onions, garlic, and curry until golden. 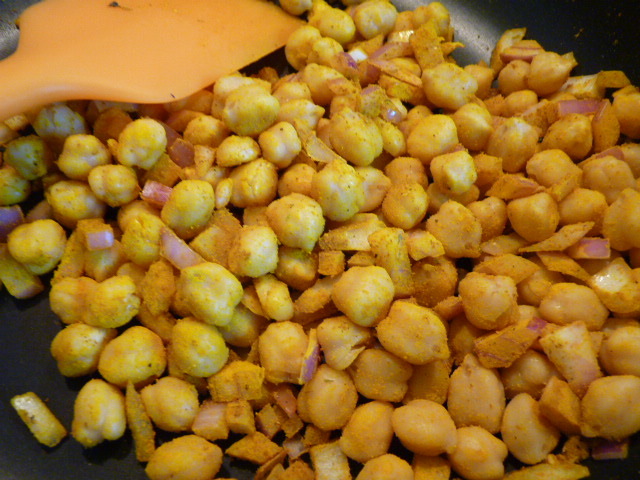 Add in the chickpeas and stir well. In a small saucepan, bring the stock to a boil. Stir in the couscous, rehydrated raisins (to rehydrate raisins, soak them in very hot water for about 10 minutes, then drain), and sundried tomatoes. Cover, remove from the heat, and let stand for 5 minutes. Fluff the couscous with a fork, and stir in the contents of the frying pan, along with the lemon zest and mint. 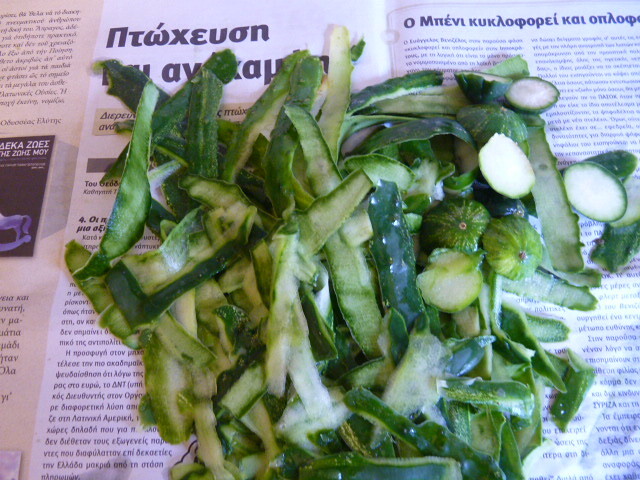 Season with salt and pepper, and a bit of lemon juice. This can be served cold or warm. 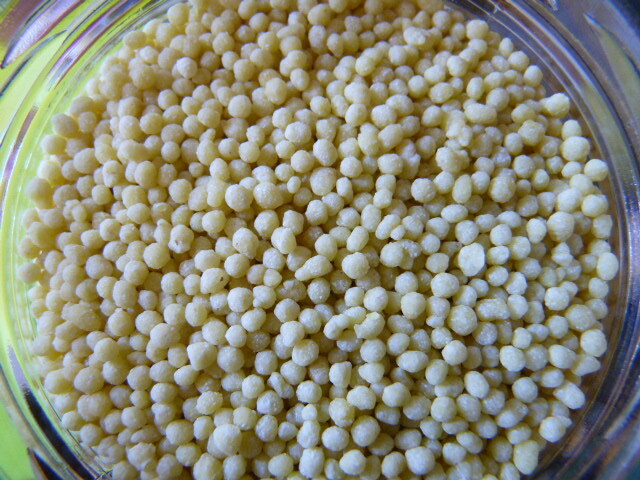 I love this couscous. It was handmade by the 87 year old woman who lives in the house next-door to where S grew up. Although no longer neighbors, he still drives out to see her at every possible opportunity. She offered to teach my mother-in-law and me how to make it this summer. I’m very excited about this! It doesn’t sound easy. And that’s your Israeli feast! We enjoyed it quite a lot … for several days! 1. 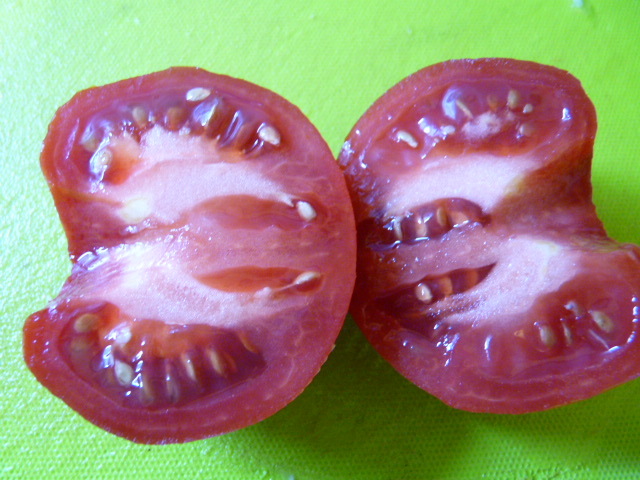 Working in a large bowl, cut the tomatoes into very small pieces. 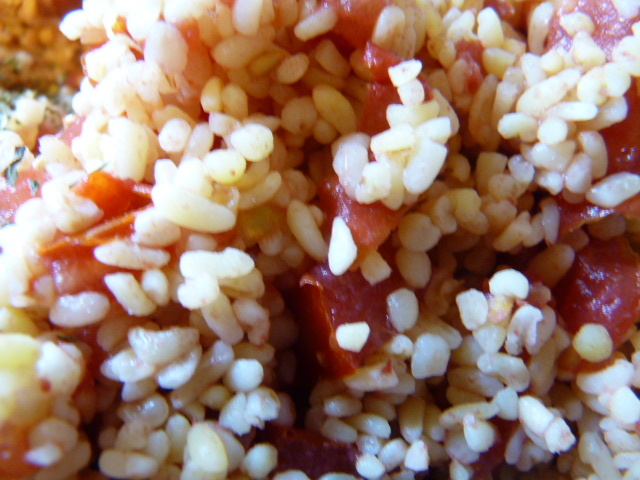 Stir the bulgur into the tomato and its juice. Cover with plastic wrap and set aside for an hour. 2. Stir in the onion, parsley, mint, olive oil, lemon juice, lemon zest, cinnamon, and salt. Cover again and set aside until ready to serve (at least half an hour). 1. Soak the chickpeas for at least 8 hours in water. Drain and rinse. Place in a pressure cooker and cover with 1″/2cm water. Bring pressure cooker up to pressure and cook for 10 minutes or until chickpeas are soft. Reserve the cooking water. 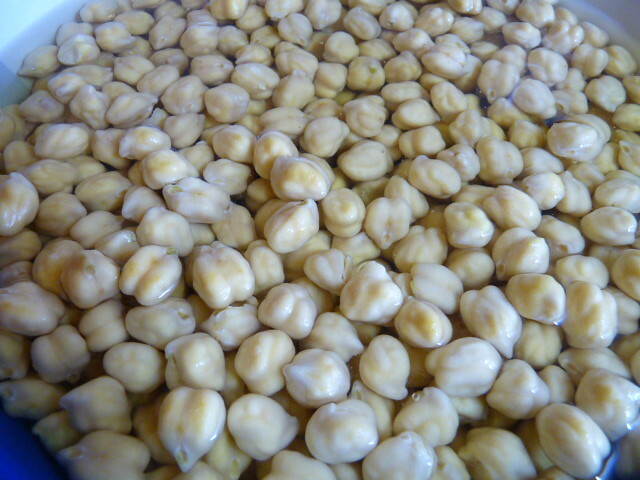 Rinse chickpeas with cool water. 2. In a food processor, combine almost all the chickpeas, tahini, lemon juice, garlic olive oil, cumin, and salt. 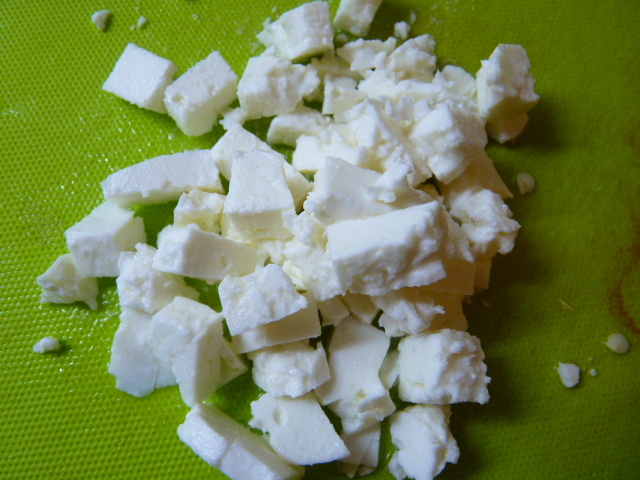 Process, adding cooking water in small amounts as needed, to reach a smooth consistency. 3. Stir in the reserved whole chickpeas. Arrange on a serving plate. Sprinkle the parsley over the top. (Optional: drizzle additional olive oil over the hummus.) Serve warm or cool. 1. Soak chickpeas for about 8 hours in water. Drain, rinse, and place in pressure cooker. Cover by 1″/2cm with water. Bring pressure cooker up to pressure and cook for 10 minutes or until chickpeas are soft. Drain and set aside. 2. In a small saucepan, boil the chicken stock. Stir in the couscous, raisins, sundried tomato, and mint. Cover and remove from the heat. Allow to sit for 5 minutes. 3. While the couscous is resting: in a frying pan sprayed with olive oil, saute onion, garlic, curry powder, and turmeric briefly with the chickpeas. 4. When the 5 minutes have passed, fluff the couscous with a fork and add it to the frying pan. Stir well and move to a serving plate. Drizzle on the lemon juice, toss, and serve. Can be served warm or cool.